The age of Instagram and a little hashtag called #stopdropandyoga has given me no shame as to where I'll do yoga. If you are tagged to #stopdropandyoga you are supposed to post a picture of you doing yoga, where ever you are. This is a fun game of tag yogi friends play on a regular basis. Some days you can get 6-10 tags and blow up your Instagram feed. I was very excited when I received my first #stopdropandyoga tag. What should I do, where should I do it, what if everyone is looking? Now when I go anywhere just out of habit I immediately look around to see where a good #stopdropandyoga place is, or what a cool picture would be. Target, no problem, there is even a hashtag #targettuesday where you will see hundreds of yogis doing crow, tree, dancer or other yoga poses on the big red balls at Target or inside. Yoga at the zoo? Yup, fun to do an animal themed pose with the animal itself! Yoga at the grocery store or Starbucks? No biggie. Yes people look, but it doesn't matter. Maybe you are inspiring someone to get into yoga, or maybe people think you are crazy and that is ok too. Yoga is fun! It is life, it is joy, so why not play with it. The downside to Instagram is the limited number of items in your notifications feed. I miss most of my #stopdropandyoga tags unless someone tags me in their photo. Just part of the game. So if you see someone in handstand at the mall or in crow at the gas station there is a good chance there are playing this yogi game of tag. Maybe you can even join in on the fun. I have been a member of F.I.T. Park Meadows since its grand opening weekend celebration in 2013. It is such an honor for me to teach yoga here now. The intensity of the F.I.T. and Crossfit workouts are so extreme, when I first started I was sore for days. At this gym I have done my first kettle bell swing, back squat, dead lift, box jump and so many other things I have never thought I would be able to do (along with some horrible things such as wall-balls, V-ups and burpees). With many of these movements, you need to have the proper alignment to prevent injury, and in many cases in order to have the proper alignment you need to have flexibility and strength in very specific areas of your body. When I tried to do my first back squat, I could not lower my heels to the floor. My coach Nicole had to put plates under my heels so I could squat properly. Same with overhead squats, my shoulders were too tight and I just could not raise the bar over my head. 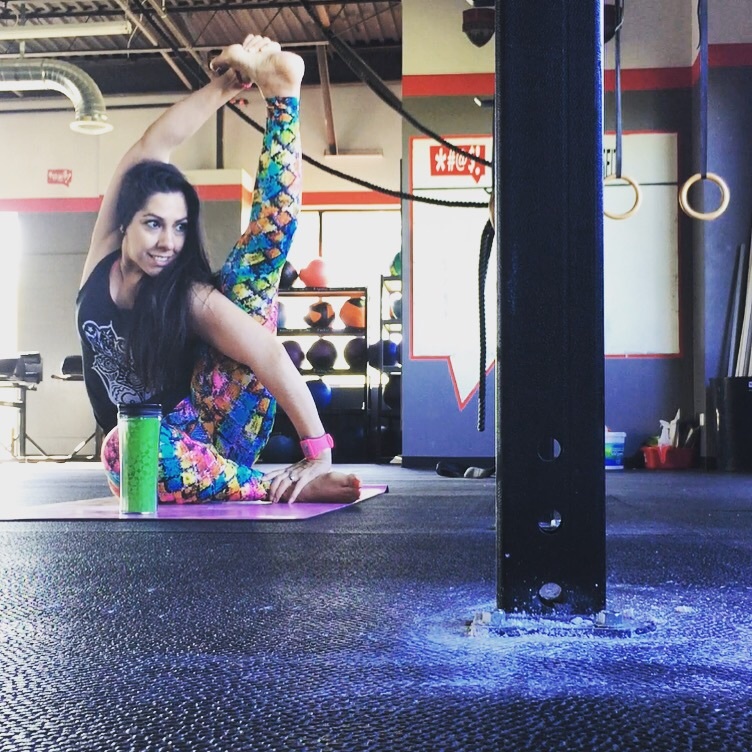 Because I have seen my abilities grow due to stretching and working on my mobility I understand what postures I need to incorporate into my yoga flows to help the athletes at this amazing gym get deeper, get stronger and hopefully stay safe during their circuits and/or WODs. I still have a long way to go, I can’t do a pistol squat yet, and would love to do a freestanding handstand and muscle up. I’m happy I belong to a community where we can help each other and celebrate each others successes.